This was the only day on this entire trip on which we did not have a specific deadline or reason to get up early, so we did not. When I woke up on my own, I thought I'd slept until noon, but in fact it was only 9 AM and I'd just managed to knock my travel alarm off the counter and jar it sufficiently to make it reset itself to 12:00. 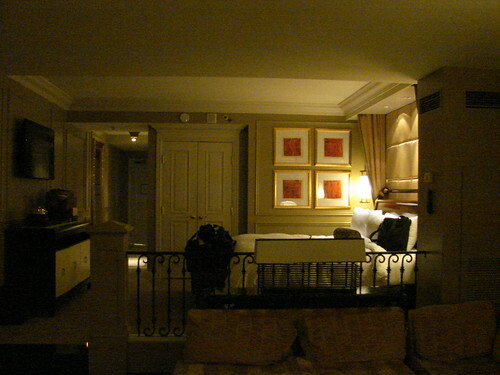 This hotel room at the Venetian is an enormous split-level suite with a vast bathroom. And as far as I can tell, this is their ordinary level or maybe possibly the first-step upgrade, not something for their real high rollers. Here's what you see when you open the door. Past the post in in the middle are two small steps down to the sunken living room. This is the living room. 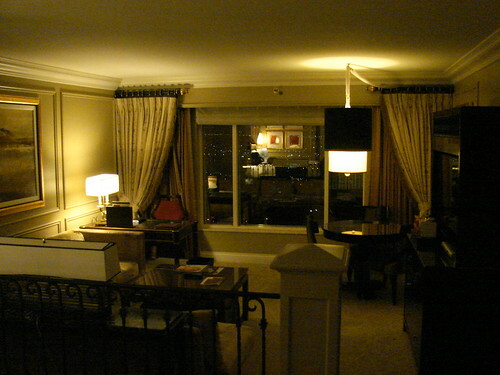 The view out the window is of the Las Vegas strip. There are power-operated curtains. The dining area is on the right, and a good work space on the left. 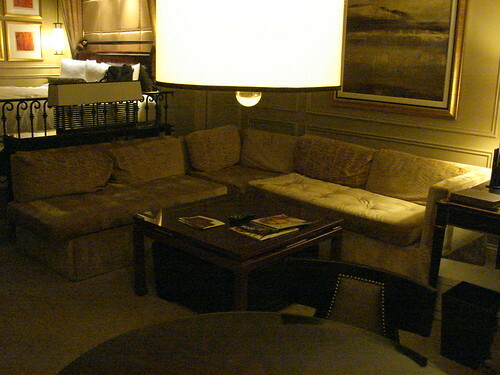 These sofas take up a large amount of the living area. I have to admit that we mostly ended up piling our luggage here. 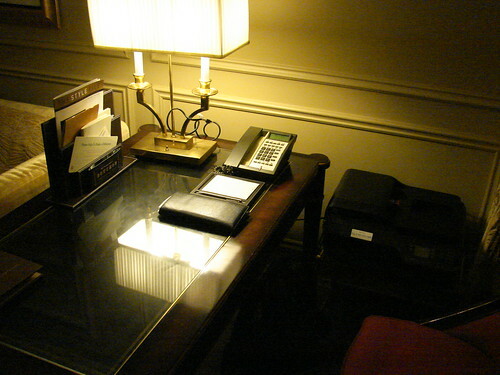 The work space has both wired and wireless internet. I was able to connect my router to it so that Lisa and I could both use it without difficulty, and the bandwidth is gratefully wide, allowing me to upload photos, video, and get my Day Jobbe done as well. There's even a printer/copier/fax machine here. The king bed has lights over it, although for some reason you can only control them from one side of the bed. The cabinet on the left lights up on top at the flip of a switch, which hardly seems necessary. Strangely, there are no drawers in this cabinet, only shelves. 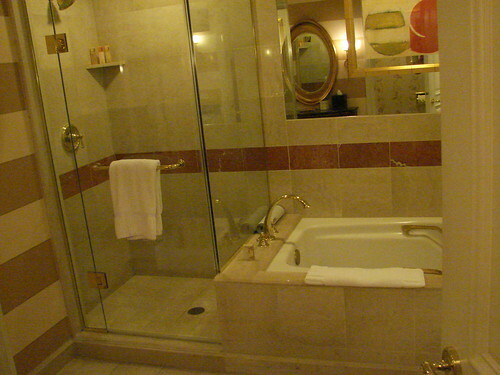 It's a big bathroom, with separate tub and shower, and a separate toilet room. The floors are marble and a bit cold and hard. For reasons unclear to me, they didn't include any wash cloths, only face and bath towels. Click through any of those photos to look at the rest of them. It's a really astonishing place, but probably not really our style. If I weren't using a free-night coupon for one of the two nights and getting the Sunday night (relatively) cheap rate for the second, I would feel that I wasn't getting the right price-value proposition. 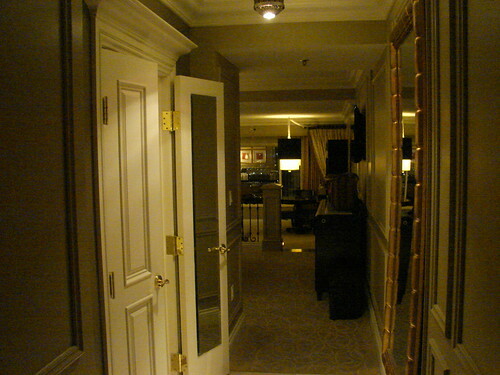 For instance, there's no coffee machine in the room; I have to go downstairs and get coffee or pay a fortune for room service. I'm glad the hotel gave me a mini-fridge, because of course I dare not even look crooked at the mini-bar or I'll be charged for it. Everything I take for granted a couple of steps down the chain (Holiday Inn Express) is extra-charge here. Mind you, when we came back to the hotel this afternoon, we decided that getting pastrami sandwiches from the deli in the food court on the second floor and taking them back to our palatial room was a good use of the place. It allowed us to start relaxing that much sooner. We had breakfast at the buffet at Treasure Island across the street, as the places in the Venetian looked too crowded. The Sunday Brunch here was good, although we've had better, most notably at the Atlantis in Reno. After that much food, I needed a walk. The Venetian and Palazzo hotels are effectively one complex connected by a shopping mall modeled as an indoor Venice. It's actually not bad at all for a walk. The canals were drained for maintenance, though. We walked through the mall and window-shopped. We didn't buy much, however. We went back to the room and I got to work with the last of the Day Jobbe stuff that had been following me and that I had been unable to get done earlier in the trip. I turned in the last piece of work so it will be in people's hands when they arrive on Monday. I've worked more than eight hours during the two weeks I've been away, so I won't feel at all guilty about taking tomorrow off as previously planned with my manager. With that load off my mind, we had the afternoon to do things. As suggested by friends, we drove over to the Pinball Hall of Fame, a massive collection of pinball machines old and new. This was fascinating, and I wish it was in Reno instead of Las Vegas so that I could spend my weekends working my way through their machines. As it was, we had to limit ourselves to playing a few machines we've enjoyed in the past and a couple others before deciding that we were too tired for much more excitement. There is of course massive opportunity to gamble here, it being the primary purpose of the place. The entire traffic flow of the hotel forces you through the casino even when gambling isn't your goal. And I admit that there might have been a few things I might have tried. But I live in Nevada already. I can walk to a casino, even one offering live blackjack if I want to play. The casinos of the Reno-Sparks area may be less elaborate than this enormous monument to excess in Las Vegas, but I find them much more accessible for a casual gambler like me. Besides, we're very tired, and Lisa still isn't really completely recovered from the cedar fever that got its claws into her while we were in San Antonio. We didn't even have the energy to go ride the Las Vegas Monorail. I think that if we're going to "do" Vegas, we'd be better off making it the entire focus of the trip, as a separate vacation, and that we need to set aside more than just two days for it. Just looking at everything there is to see and do here makes me tired. And I am now completely convinced that Las Vegas would be a terrible place for a Worldcon. We would be utterly lost here, like a drop of ink in a barrel of water. In Reno we were okay. We'll probably do quite well in Spokane, as we'll "own" the city the way we did Winnipeg in 1994. But Vegas? Never. Even ComicCon (which apparently was once flirting with the idea of moving here) might have difficulty overwhelming this place. Tomorrow morning we have the final leg of the trip ahead of us, and it's a long one: over 420 miles from Las Vegas to Fernley via Tonopah. I'm not looking forward to this drive, but I am looking forward to getting home.